According to police sources, the young lady, who was the lone driver of a red Sports Utility Vehicle (SUV) escaped with minor injures yesterday Thursday, January 17, 2019. She apparently lost control of the SUV and collided into a utility pole with the car suffering major damages and altering the pole. Many on social media have since said that a tree next to the pole in which she collided, had one of the infamous posters that one man of the cloth, Bishop John I. Cline labelled, "satanic" and "brings evil energies." Our newsroom is still on the hunt for the artiste or persons responsible for putting up the mysterious posters of cats, dogs and ‘I love the BVI’ around the Island of Tortola. They also erected posters of Santa Clause during the holiday season. 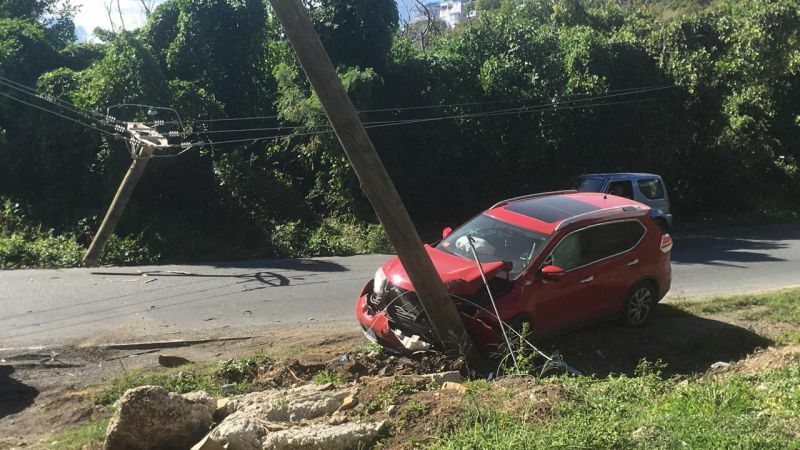 Following the accident yesterday, police were called to the scene and are investigating the matter that took place just before 1:00 PM in the area of Sophie Bay, on Tortola. The Minister’s daughter is said to be at home recovering from minor bruises but still in shock over the incident. If this man is really of the Cloth, his Faith is weak! Come on! If God is in your heart, things of these nature should bare no consequences! The Mind is a terrible thing to waste, especially when it comes to mental washing. Your mind is really weak if you don’t understand how the powers of darkness operate. It’s the devil that has you ignorant. Always someone else's fault. Satanic poster, or otherwise. It was an unfortunate accident, nothing more. Hope the young lady is better soon. her dad obeah should be strong enough! I fully agree with you. The lack of street lighting also presents a danger. However most people speed down that hill and underestimate the curve and end up in similar predicaments. That is the second time this month that that pole got snapped in half. Satan my rass...always some excuse for your own f ups..at least it aint whitey fault...this time.Yall to darn distracted by everything yall encounter.In life and Driving..KEEP YOUR EYES ON THE ROAD.I don't now the young lady and only she know what happened..get well soon...To the one day Christians...get a life.bye bye.